Energy is emerging as a significant challenge in the development of the world’s digital economy, as I discussed in my previous blog post. Now, let’s consider how groundbreaking energy solutions will create a digital power economy with revolutionary potential for better living. The digital revolution is fostering an energy revolution, toward an “always on” paradigm, and a “surge” for power not yet experienced in energy history. This energy revolution is achievable: Digital, decentralized electrification is the only path to build a completely different paradigm where energy can become much more affordable, easy to access, and increasingly reliable. (PV). Today, PV energy follows a 15 to 20% adoption trend, leading to a 20% reduction in costs on a year-on-year basis, on average. rgy system, follows similar cost trends. By 2040, PV and storage combined could be so cheap that it would be less costly to produce (and store) a Joule of PV than a Joule of oil or natural gas. PV is also abundant, and by nature, distributed. Decentralized electrification based on PV has the potential to completely transform the energy paradigm, taking us from a century of energy based on fossil fuel extraction to a new world of easy-to-access, affordable energy. Maryland’s Montgomery Country (U.S.), for example, is tapping into the benefits of PV energy. The county has engaged Duke Energy Renewables and Schneider Electric to deliver advanced microgrids for its public safety headquarters and a correctional facility. 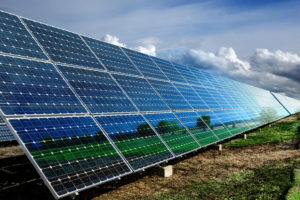 The Microgrid-as-a-Service solution will increase resiliency and sustainability by incorporating solar energy and high-efficiency combined heat and power into an off-grid operation. These microgrids will produce energy equivalent to powering 400 average-sized homes each year – about 3.3 million kWh of solar energy. The county expects to reduce its utility usage by about 36%, which is close to $84,000 a year. The energy revolution certainly means a substantial shift for the traditional power industry. The centralized power system model needs to be reinvented to enable more decentralized management. At the same time, the requirements for high-level reliability of power will significantly increase, transforming today’s power distribution installations into critical infrastructures, which would require significant and promising evolutions to the current value chain. By leveraging digital technologies, we can solve such challenges. That’s because digitization will enable dynamic interactions between the various actors of the power system – on the traditional capex/opex value chain as well as on energy markets – and deliver stronger control capability in a growingly complex operations environment. Power systems of the future will digitize the economy, and they will be enabled by digital technologies.